It has been two months since my last post, but we have been super busy since we got back from Mexico finishing up some little jobs we had around the house. Some of our family members think we have really lost our senses. We may be embarking on a truly life changing experience! Our house is up for sale now and if or when it sells, we have nowhere to go but onto Splendid Mane! Well not really but this is our Plan A.... sell the house and live on Splendid Mane for the summer and fall months, then head back to Mexico for the winter and spring. Sounds simple enough, but we are talking moving from 3400 square feet to 400 square feet on the generous side, from a house that is always in the same place to one that moves constantly, and from the convenience of stepping out the door into the car for groceries, to having to get into the dingy and then walk to the closest grocery store. The differences are many, but what is exciting for us is the change in our lives. I have always been fascinated by how a couple (or a family) can co-exist in such a small space for any length of time, how the day to day jobs of just living are achieved, keeping a bit of privacy for each, and still enjoy each and every moment of it. 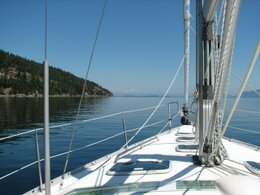 Blogging about living on a sailboat is nothing new, but every blog has a little different spin on things. We also have a Plan B..... get a truck and camper and take off. Travelling for a couple years through North and South America would be an adventure. Plan C.... buy a small property (5 acres +/-) and build our own house, making it as green as possible. We have so many ideas about how we would build, it is almost overwhelming! And Plan D... well that is the most domestic choice.... rent a house on Vancouver Island somewhere, probably Nanaimo to be close to our grandson, and go to Mexico for the winter. We will see what the future brings, anything could happen! We are ready for a new adventure in our lives. We have taken the first step, now we just have to wait and see. There is also the possibility that our house won't sell and we will stay here..... but in that case we have plans for that too!